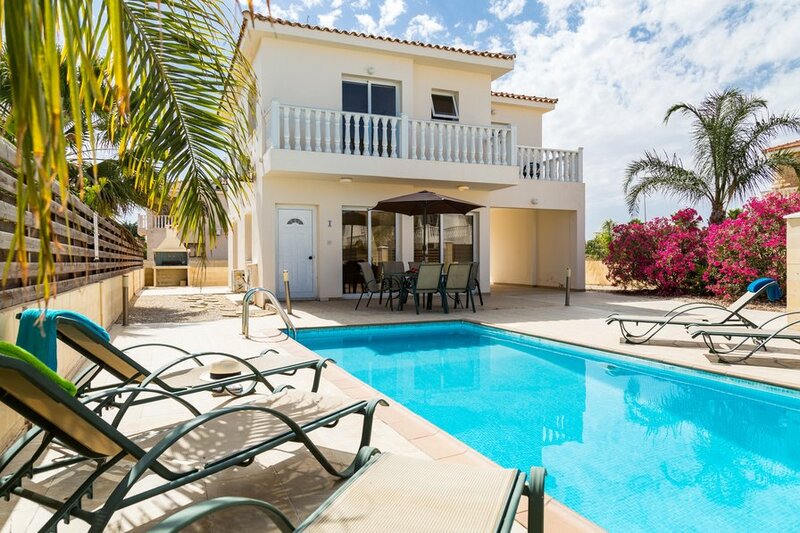 Villa Creoso is located on a quiet residential complex just minutes from the popular Ayia Thekla and Siren Beaches. Downstairs you have a spacious open plan area consisting of kitchen, dining and living areas. The kitchen is very well equipped for those that wish to dine at home. The dining area seats up to 6 persons and the living area has a comfortable homely feel to it, complete with Satellite TV and FREE Wi-Fi. Completing downstairs is a separate WC with wash basin. Upstairs we have three large bedrooms. A spacious double bedroom on the front with large patio doors leading onto your personal balcony. A twin bedroom, also on the front, again has patio doors leading onto your own balcony. The balconies offer great views of the sea and the Cape Greco national park. A third bedroom, another twin bedroom is to the rear of the property. All bedrooms have ample wardrobe space, bedside tables and lamps. A large family bathroom with shower completes upstairs. All rooms are fully air conditioned throughout and is included in the rental price. To ensure responsible use is maintained, timer switches are fitted to all units, this also prevents any breakdowns during your stay. Outside is a large spacious patio area with plenty of sun-loungers and seating for all. The pool is professionally maintained during your stay. Towards the back of the villa there is a BBQ area complete with traditional Cypriot BBQ - perfect for cooking souvlaki! Fresh bed linen and towels are supplied but please bring your own beach towels. You will have contact of a local English speaking representative, 24 hours a day during your stay.